Wicklow Archers will be hosting a Double FITA 18m shoot on the 5th of January, 2014, in Shoreline Leisure Centre, Gresystones, Co. Wicklow. Practice starts at 10am and shooting-proper starts at 10.30am. The entry fee is €15 or €10 with concession. The deadline for entries is 1st January, 2014. You can enter the competition by filling out the form below. If you have any pre-entry questions, please use the “Contact Us” form at the bottom of this page. 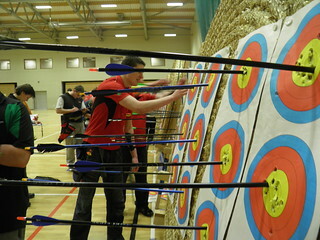 This entry was posted in Club Competitions, Indoor Competitions, Target Competitions. Bookmark the permalink.